MR_SLINSorry for the late reply. I'm not sure what you meant in that last sentence (local server what?) but my MvM hud doesn't have a hud thingy to ready up (which is causing an issue when I'm trying to see ready statuses in PugChamp), I don't have an objective UI (i.e. where the bomb is) and my scoreboard is broken as you mentioned. I can try your scoreboard fix though! mainly in the parts that that deal with "if_readymode"
that part is quite new to the files, so you might have to start from the default files. so you might have to start from the default files. I would suggest the same, or at least 'compare' and duplicate your original changes to a fresh file extracted from the VPKs or taken from here. 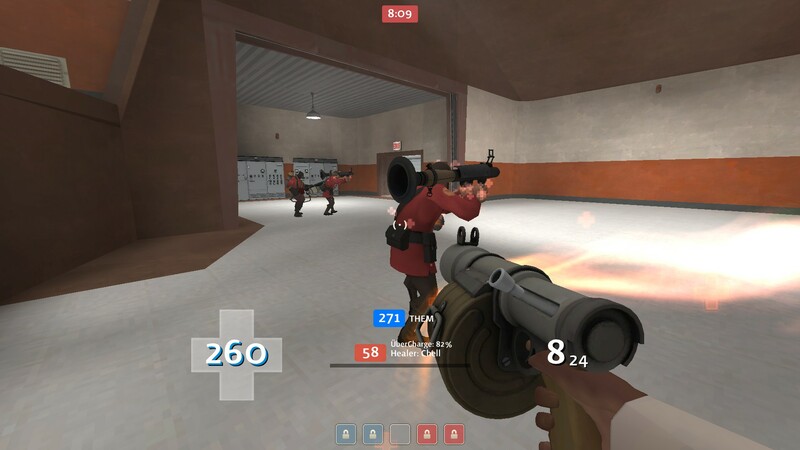 I would suggest the same, or at least 'compare' and duplicate your original changes to a fresh file extracted from the VPKs or taken from [url=https://github.com/MFSTATE/tf2basehud/blob/master/resource/ui/hudtournament.res]here[/url]. Thank you, Wiethoofd. I was able to fix the vaccinator issue. In the above image, the Currently Healing health cross is clipped off by something. I tried messing with hudlayout.res, targetid.res, and spectatorguihealth.res but I couldn't figure out what was causing that. Similarly, the health cross above the player is also clipped off. What parameters controls the invisible box above the player's head and around the targetID? WiethoofdIn TargetID find spectatorguihealth and change "HealthBonusPosAdj" to it's default value of 10 and the HealthDeathWarning to 0.49 and see if this improves the issue. Both of these were already set to default. I can't figure out why the overheal health cross above the player's head is behaving differently from targetID. "fillcolor"	"0 0 0 200"
"fgcolor"	"220 220 220 255"
"fgcolor"	"150 250 150 255"
EDIT: After trying it with the default HUD, the same issue with the overheal cross arises. Even in the default HUD, the overheal cross above the player's head doesn't change size. In TargetID find spectatorguihealth and change [i]"HealthBonusPosAdj"[/i] to it's default value of 10 and the [i]HealthDeathWarning[/i] to 0.49 and see if this improves the issue. whenever i start capping a point, this huge control point indicator pops up in the top of my screen, indicating the capping progress. if anyone can tell me where this is located and how do i get rid of it, i'd appreciate. also, if you don't mind two asks, can someone tell me what file i need to go to edit the round timer that stays on the top of the screen. I completely forgot how to get rid of the thing on the bottom-left, i thought it was on HudPlayerClass, but i can't get rid of it. [*] I completely forgot how to get rid of the thing on the bottom-left, i thought it was on HudPlayerClass, but i can't get rid of it. Is there any way to make damage indicators not so close to targets? Usually it's not a problem, but I'm finding playing heavy more that the damage numbers are super distracting (overlapping the target) at range. I suppose I could turn them off for just heavy, but I'd still like access to the total damage information, if possible. It is hudplayerclass, it's PlayerStatusClassImage and it's bg. 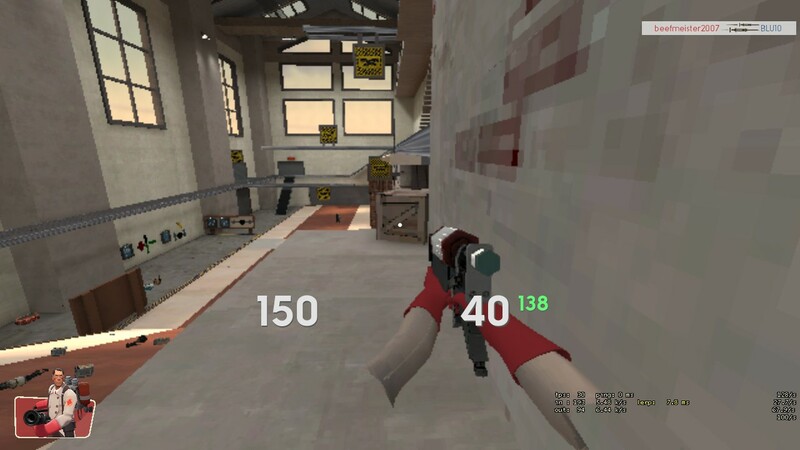 What's the easiest way to edit the tournament HUD with mp_tournament_readymode 1/2 (also, what's the difference between 1 and 2 for that cvar)? In a local server, I can only see my own player panel, and I can't activate the countdown. VooperIs there any way to make damage indicators not so close to targets? Usually it's not a problem, but I'm finding playing heavy more that the damage numbers are super distracting (overlapping the target) at range. I suppose I could turn them off for just heavy, but I'd still like access to the total damage information, if possible. EricWhat's the easiest way to edit the tournament HUD with mp_tournament_readymode 1/2 (also, what's the difference between 1 and 2 for that cvar)? Record a demo in a lobby/pickup that has this enabled. I have one but it's a very long one, I'll try to make one that can be shared along with other useful demos to make editing in certain situations easier. Change "item_ydelta" in ClassLoadoutPanel in the top section to move them up or down. Change [i]"item_ydelta"[/i] in ClassLoadoutPanel in the top section to move them up or down. so my team labels aren't showing up on my scoreboard. I've checked console/the file for missing braces or quotation marks but there aren't any missing. Can't remember when this started happening, but it was fairly recent. A recent update fucked this one up. They only appear when a competitive config is being run. My suggestion would be to have a custom blue/red label, and add the background color of the team to the original blue/red labels with a higher zpos, so in comp the custom labels can be hidden underneath and the team names can be changed on the scoreboard. Ideally you would export/move your custom animation events to a separate file, add that file as line to the hudanimations_manifest.txt and leave the _tf one alone so it's using the one that comes with your game and doesn't get out of date anymore. Ideally you would export/move your custom animation events to a separate file, add that file as line to the [i]hudanimations_manifest.txt[/i] and leave the _tf one alone so it's using the one that comes with your game and doesn't get out of date anymore. I do not know what file I have to edit/remove in order to do this. I am incredibly inexperienced with editing this, what exactly do I change here? I have already changed the color of the health numbers themselves, but I'm not sure what to change here to get rid of the highlight. Does anyone know what file controls the contract drawer? More specifically the details on what you need to do, along with the in-game one? Which resource file moves the actual control point icon in koth/cp game modes? I've tried fiddling around with the x/ypos values in Controlpoint.res, but it's not doing anything. TERRYCREWSWhich resource file moves the actual control point icon in koth/cp game modes? I've tried fiddling around with the x/ypos values in Controlpoint.res, but it's not doing anything. #2158, statsummary.res for everything on the screen minus the loading box. To change the loading box you need to import in the loadingdialog*.res files from Team Fortress 2/hl2/resource into your hud's resource folder. Stochast1c#2158, statsummary.res for everything on the screen minus the loading box. To change the loading box you need to import in the loadingdialog*.res files from Team Fortress 2/hl2/resource into your hud's resource folder. Thanks, now I would like to know if I can use the stat screen and background from QTCHud in OmpHud? And if its possible what do I need to edit?